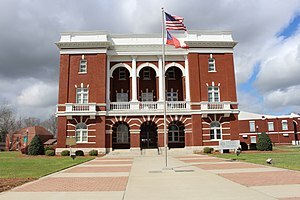 Tattnall County is a county located in the southeast portion of the U.S. state of Georgia. As of the 2010 census, the population was 25,520. The county seat is Reidsville. The county was created on December 5, 1801 from part of Montgomery County, Georgia by the Georgia General Assembly. It is located within the Magnolia Midlands, a part of the Historic South region. According to the U.S. Census Bureau, the county has a total area of 488 square miles (1,260 km2), of which 479 square miles (1,240 km2) is land and 8.9 square miles (23 km2) (1.8%) is water. Most of the western portion of Tattnall County, defined by a line running from Cobbtown south to Collins, then east to a point halfway to Bellville, and then south and southwest to the middle of the county's southern border, is located in the Ohoopee River sub-basin of the Altamaha River basin. The northeastern portion of the county, from Cobbtown to east of Reidsville, is located in the Canoochee River sub-basin of the Ogeechee River basin. The southeastern and southwestern parts of Tattnall County are located in the Altamaha River sub-basin of the larger river basin by the same name. As of the census of 2000, there were 22,305 people, 7,057 households, and 4,876 families residing in the county. The population density was 46 people per square mile (18/km²). There were 8,578 housing units at an average density of 18 per square mile (7/km²). The racial makeup of the county was 60.51% White, 31.43% Black or African American, 0.14% Native American, 0.29% Asian, 0.08% Pacific Islander, 6.64% from other races, and 0.92% from two or more races. 8.44% of the population were Hispanic or Latino of any race. There were 7,057 households out of which 33.00% had children under the age of 18 living with them, 51.10% were married couples living together, 13.40% had a female householder with no husband present, and 30.90% were non-families. 26.70% of all households were made up of individuals and 11.90% had someone living alone who was 65 years of age or older. The average household size was 2.60 and the average family size was 3.12. In the county, the population was spread out with 22.90% under the age of 18, 11.20% from 18 to 24, 34.60% from 25 to 44, 20.00% from 45 to 64, and 11.20% who were 65 years of age or older. The median age was 34 years. For every 100 females there were 136.10 males. For every 100 females age 18 and over, there were 146.30 males. The median income for a household in the county was $28,664, and the median income for a family was $35,951. Males had a median income of $28,994 versus $19,984 for females. The per capita income for the county was $13,439. About 18.60% of families and 23.90% of the population were below the poverty line, including 32.90% of those under age 18 and 20.20% of those age 65 or over. As of the 2010 United States Census, there were 25,520 people, 8,210 households, and 5,568 families residing in the county. The population density was 53.2 inhabitants per square mile (20.5/km2). There were 9,966 housing units at an average density of 20.8 per square mile (8.0/km2). The racial makeup of the county was 62.7% white, 29.3% black or African American, 0.4% Asian, 0.3% American Indian, 0.1% Pacific islander, 6.0% from other races, and 1.3% from two or more races. Those of Hispanic or Latino origin made up 9.8% of the population. In terms of ancestry, 12.9% were Irish, 6.6% were German, and 5.2% were American. Of the 8,210 households, 34.2% had children under the age of 18 living with them, 48.4% were married couples living together, 14.1% had a female householder with no husband present, 32.2% were non-families, and 27.7% of all households were made up of individuals. The average household size was 2.52 and the average family size was 3.07. The median age was 36.6 years. The median income for a household in the county was $38,522 and the median income for a family was $45,601. Males had a median income of $35,240 versus $27,584 for females. The per capita income for the county was $16,742. About 14.7% of families and 21.4% of the population were below the poverty line, including 27.1% of those under age 18 and 11.9% of those age 65 or over. The Georgia Department of Corrections operates the Georgia State Prison in unincorporated Tattnall County, near Reidsville. ^ "Tattnall County Historical Maps". Retrieved 28 May 2013. ^ "Georgia State Prison Archived 2008-03-05 at the Wayback Machine." Georgia Department of Corrections. Retrieved on September 14, 2010.